This book is for robotic enthusiasts, researchers and professional robotics engineers who would like to build robot applications using ROS. It gives the robotics beginner and the ROS newbie an immensely practical introduction to robot building and robotics application coding. Basic knowledge of GNU/Linux and the ability to write simple applications is assumed, but no robotics knowledge, practical or theoretical, is needed. ROS is a robust robotics framework that works regardless of hardware architecture or hardware origin. It standardizes most layers of robotics functionality from device drivers to process control and message passing to software package management. But apart from just plain functionality, ROS is a great platform to learn about robotics itself and to simulate, as well as actually build, your first robots. This does not mean that ROS is a platform for students and other beginners; on the contrary, ROS is used all over the robotics industry to implement flying, walking and diving robots, yet implementation is always straightforward, and never dependent on the hardware itself. 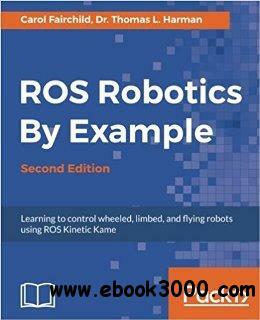 ROS Robotics has been the standard introduction to ROS for potential professionals and hobbyists alike since the original edition came out; the second edition adds a gradual introduction to all the goodness available with the Kinetic Kame release. By providing you with step-by-step examples including manipulator arms and flying robots, the authors introduce you to the new features. The book is intensely practical, with space given to theory only when absolutely necessary. By the end of this book, you will have hands-on experience on controlling robots with the best possible framework.